Vatican City – Holy See Our third day in Rome, and a Monday, we decided it was the perfect day to visit the Vatican city. Unfortunately for us, it didn’t turn out to be a perfect day as we were met with a thuderstorm as soon as we stepped out of the hotel. Ill equipped to handle the downpour, we first bought umbrellas for 3 Euros each, bargained down from 5 Euros, and then rushed to the train station. Nearer to Vatican, the rains had gotten worse and it only took us a few minutes to decide that we will immediately join a tour group (40 Euros/person) which included the entrance fee, an audio guide, no waiting in line to get in, and a 4 hour guided tour. We still had to wait for about 30 minutes but we managed to get in by around 10:30am. State of the Vatican City (Stato della Città del Vaticano), is a landlocked sovereign city-state whose territory consists of a walled enclave within the city of Rome, the capital city of Italy. At approximately 44 hectares (110 acres), and with a population of around 900, it is the smallest country in the world by both area and population. The Vatican City is a city-state that came into existence in 1929 and is thus clearly distinct from the central authority of the Roman Catholic Church, known as the Holy See, which existed long before 1929. Ambassadors are officially accredited not to the Vatican City State but to “the Holy See”, and papal representatives to states and international organizations are recognized as representing the Holy See, not the Vatican City State. Our first stop inside the Vatican was the Vatican Museums. The Vatican Museums (Musei Vaticani), in Viale Vaticano in Rome are among the greatest museums in the world, since they display works from the immense collection built up by the Roman Catholic Church throughout the centuries. Pope Julius II founded the museums in the 16th century. The museums are visited by over 4 million people per year. The Vatican Museums trace their origin to one marble sculpture, purchased 500 years ago. The sculpture of Laocoön, the priest who, according to Greek mythology, tried to convince the people of ancient Troy not to accept the Greeks’ “gift” of a hollow horse, was discovered 14 January 1506, in a vineyard near the basilica of Santa Maria Maggiore in Rome. Pope Julius II sent Giuliano da Sangallo and Michelangelo Buonarroti, who were working at the Vatican, to examine the discovery. On their recommendation, the pope immediately purchased the sculpture from the vineyard owner. The pope put the sculpture of Laocoön and his sons in the grips of a sea serpent on public display at the Vatican exactly one month after its discovery. From the museum we walked through the courtyards of the Vatican, seeing the early sculptures by the Greeks that served as the inspiration for the furture Rennaisance artists. We saw the ‘Sfera Con Sfera’ (Sphere Within Sphere) by Italian artist Arnaldo Pomodoro at the Cortile della Pigna and then proceeded towards the Sistine Chapel. This is the highlight of any Vatican tour, so we were sufficiently prepped at what to look for. There is no photography allowed inside the chapel, as the rights to all the artwork belongs to Nippon TV but the guards are very lax at enforcing the rule. Ofcourse if you have an SLR they will stop you. All of this doesn’t matter as once inside you will not have the time or the desire to do anything but stare at the ceiling. Every painting on the ceiling from the creation of Adam to the side figures and the Last Judgement at the altar will hold you in a trance. If Michelangelo spent 4 years painting the ceiling alone, you will need 4 years to understand and admire it. One visit wasn’t enough so we patiently went all the way around through the museum and entered the chapel for a second time. During our second walk through the museum we visited the Raphael Rooms or Stanze di Raffaello. They are famous for their frescoes, painted by Raphael and his workshop. Together with Michelangelo’s ceiling frescoes in the Sistine Chapel, these are the grand fresco sequences that mark the High Renaissance in Rome. The rooms are Sala di Costantino (“Hall of Constantine”), the Stanza di Eliodoro (“Room of Heliodorus”), the Stanza della Segnatura (“Room of the Signatura”) and the Stanza dell’incendio del Borgo (“The Room of the Fire in the Borgo”). The Fire in the Borgo was our favorite as every character in the painting was in mid-movement and each is different. The Adam and Eve painting is belived to have been done entirely by Raphael. Our last stop was The Papal Basilica of Saint Peter (Basilica Sancti Petri), officially known in Italian as the Basilica Papale di San Pietro in Vaticano and commonly known as St. Peter’s Basilica, located within the Vatican City. St. Peter’s has the largest interior of any Christian church in the world, holding 60,000 people. It is regarded as one of the holiest Christian sites and has been described as “holding a unique position in the Christian world” and as “the greatest of all churches of Christendom”. Tradition holds that Saint Peter’s tomb is below the altar of the basilica. For this reason, many Popes have been interred at St Peter’s since the Early Christian period. There has been a church on this site since the 4th century. Construction on the present basilica, over the old Constantinian basilica, began on April 18, 1506 and was completed on November 18, 1626. 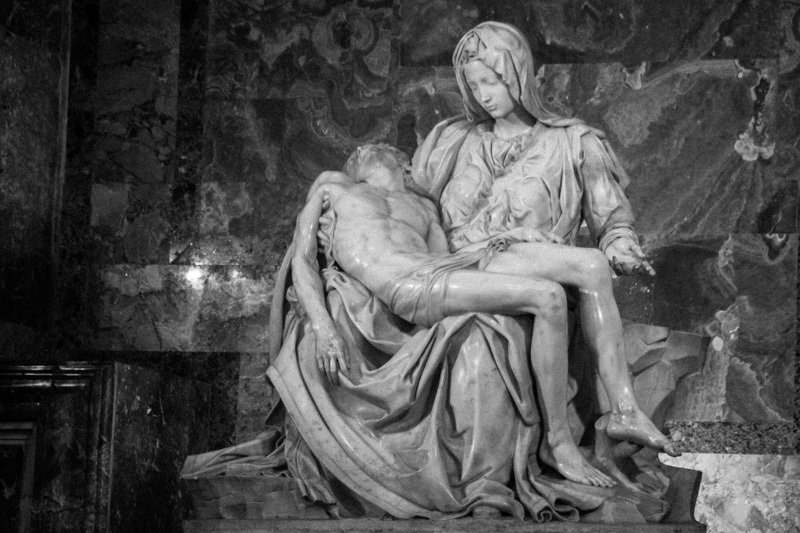 It might take days to walk the full stretch of the basilica and see every sculpture or painting but a must see is Michelangelo’s La Pieta. Michelangelo’s statue is different from most earlier pietà statues, which were usually smaller and in wood. The Virgin is also unusually youthful, and in repose, rather than the older, sorrowing Mary of most pietàs. She is shown as youthful for two reasons; God is the source of all beauty and she is one of the closest to God, also the exterior is thought as the revelation of the interior (the virgin is morally beautiful). At the end of this we weren’t sure if Michelangelo is a sculptor first, or painter or architect as he excelled equally in all. We finished our trip to the Vatican by relaxing in St. Peter’s Square.